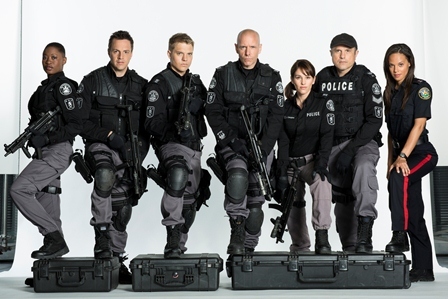 Bid now in the Flashpoint “Because Heroes Are Human” auction | TV, eh? By Diane Wild of TV, eh? Flashpoint airs its final episode December 13, ending a five-season run that gave Canadians a homegrown show to be proud of — most importantly for its entertainment value and quality, but also for letting Toronto be Toronto and for cracking the US market on a major network in primetime, paving the way for other exports such as Rookie Blue, The Bridge, and even other non-cop shows. The show’s enthusiastic fanbase even named Flashpoint the best Canadian show ever in TV, eh?‘s Throwdown Showdown. Creators Mark Ellis and Stephanie Morgenstern have used their Flashpoint voice to help advocate for the real-life heroes who inspired their show. Today, they launched an auction of Flashpoint memorabilia with proceeds to The Tema Conter Memorial Trust, an organization that assists emergency and military services personnel. Check out the unique items up for bid – Spike’s uniform, Enrico Colantoni’s warm up Jacket, autographed DVDs and scripts, and so much more – at www.tv-eh.com/flashpoint-auction.